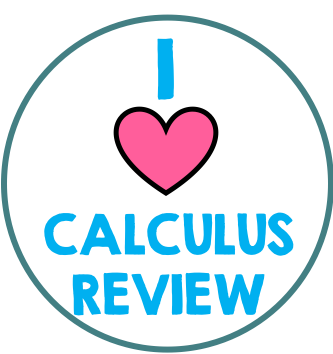 It's that time of year again...Calculus Review! This year, we are fortunate that the AP Calculus test is later in May - May 15 to be exact. I finished the material about 2 weeks ago, so I have been working with plenty of review time. Another way to try speed dating is to start the students in groups of two. Make as many questions as you will have groups. Set a timer for 2 minutes. When the time starts, students can only speak to the student they are partnered with. They work on one of the questions. When the timer goes off, one student moves around the circle one way, and the other students moves around the circle the other way. Students work with many other partners, and with only 2 minutes to work there is no time for goofing off! 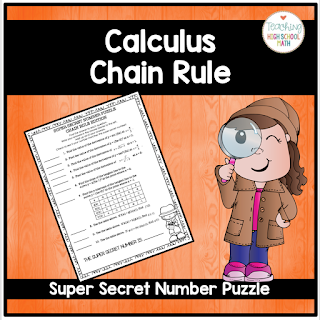 2) Try Puzzles - My favorite type of puzzle to give my calculus class is the Super Secret Number puzzle. In this puzzle, students are given approximately 10 questions of the same type. Students work the questions and then add up their answers. This is the Super Secret Number. When students think they have the Super Secret Number, they go up to the board and scan a QR Code with the Super Secret Number embedded in it. If their super secret number matches my Super Secret Number, they are probably correct. Exciting! 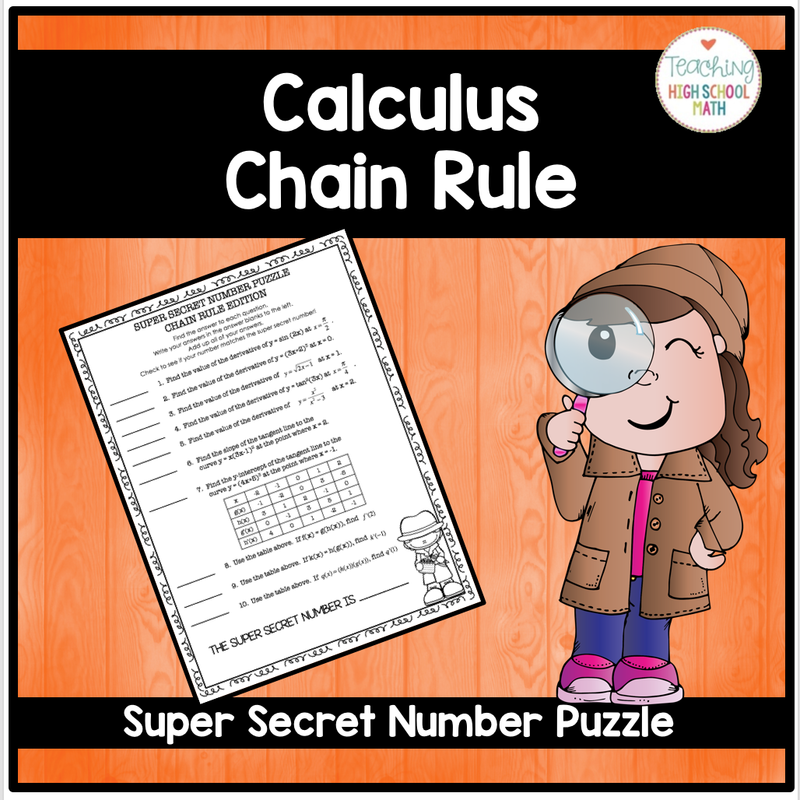 I have Super Secret Number Puzzles in my store for many different calculus topics. 3) Make Students Responsible for Explanations - One of the biggest things I struggle with is that not all of the students need me to review and explain the same things with them. Some need help with u-substitution, some need help with the chain rule, some need their algebra corrected...you understand. So, sometimes I feel that going over multiple choice problems in class as a whole group is a waste of time. So this year I am trying a new way of going over a practice test we did. (From Barron's, not from a secure test :) The students took the entire test over two class days. They entered their answers into a google form so I could analyze which questions were the most often missed. Starting tomorrow, students will be assigned a slide in Google Slides. They have a specific question they must explain in Google Slides. They can insert text boxes, a picture of their work, a link to a video they might find helpful, a graph, etc. Then other students can look up any problems they need help with. 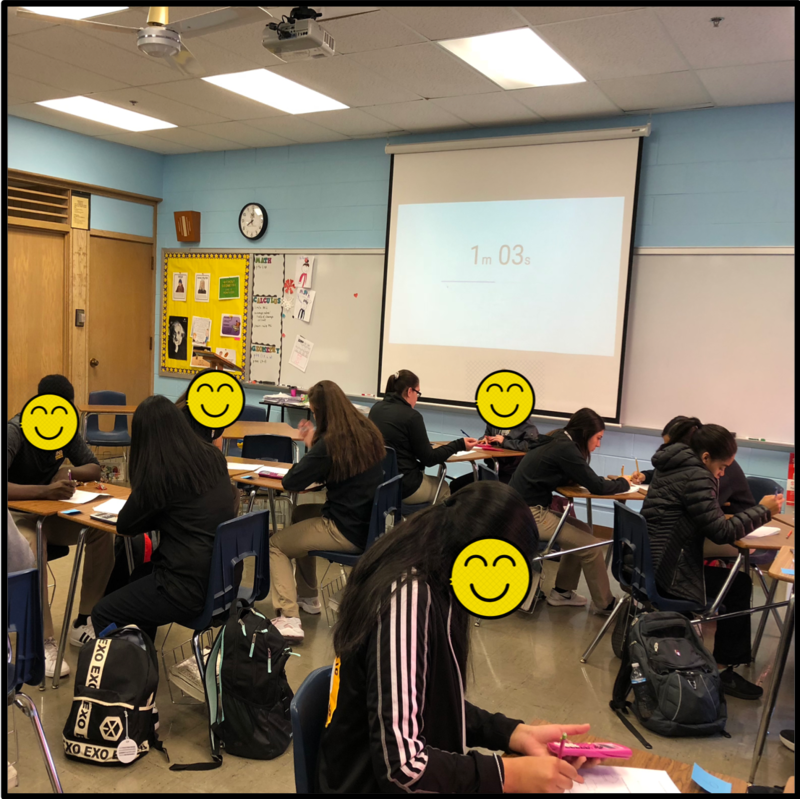 4) Be Sure They have the Basics - There are some questions on the AP test that are downright difficult, but there are some that are basic questions that students need to be able to answer easily. So, I have a mastery test on Derivatives and Integrals that I give my students. 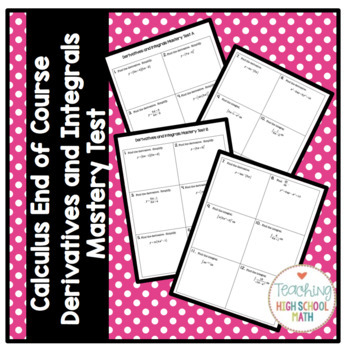 This Mastery test tests to see if students can use the product rule, quotient rule, chain rule, u-substitution, etc correctly. I have 4 different forms of it. If you like the ideas you see above, subscribe to mailing list and you'll get more fun ideas and freebies! 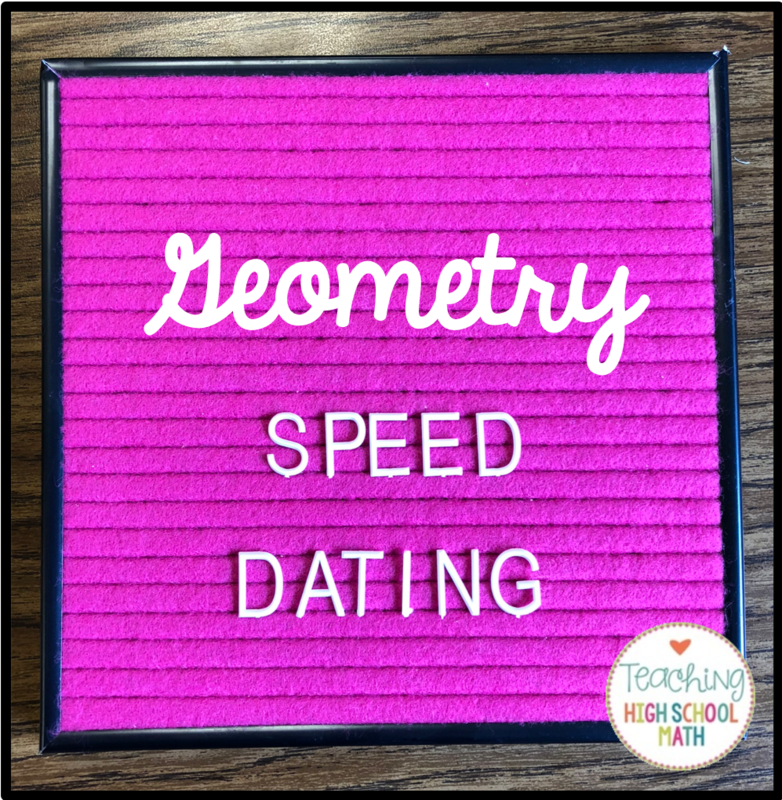 We tried Speed Dating in Geometry today! 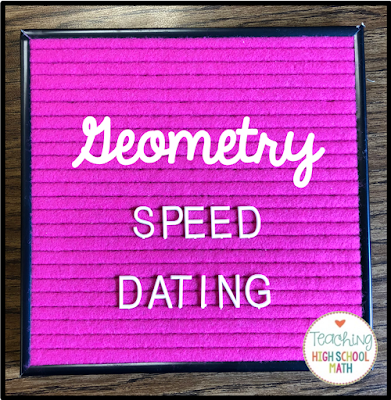 I have tried the idea of Speed Dating before, but never in a geometry class. I have used it in upper level courses before, but I wasn't sure how it would work with a younger group. I am happy to report that things went great! It took a bit of work to get things organized, but after that, this activity ran itself. Here is a picture of my class while they were working. I had a geometry worksheet ready to go with 13 questions on it. I had the students sit with partners that I had selected using flippity.com. [I had 13 stations set up around the room with a problem number on each set of 2 desks.] After I gave the worksheets, I had each set of partners start with the problem number on their desk. I set a timer for 2 minutes which I projected up onto the screen. After two minutes the timer went off and students got up and switched stations. One partner moved one way and one partner moved the other way. This gave students the chance to work with many other partners throughout the class period. No one could get too comfortable because after 2 minutes, they had to move. This really kept the students working! At the end of 26 minutes or so [2 minutes per question], the students were back in their original seats. I had them enter their answers into a google form so I could easily check their answers. I love having my class work in groups. But, sometimes the group work turns in to group chat time. So I have come up with two things to help to make sure that learning is happening! 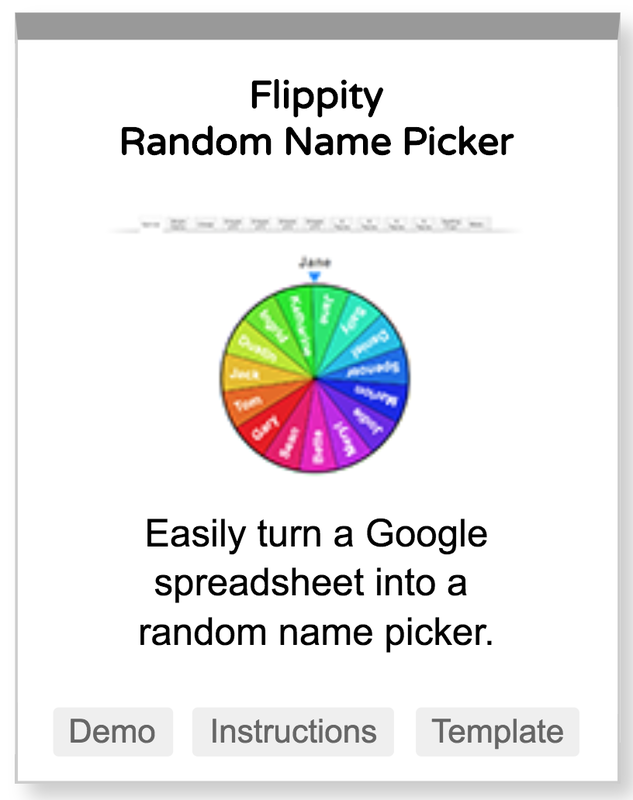 There are lots of things you can do with flippity such as making flashcards, making a jeopardy game board, and making a word search. But, my favorite thing to do with Flippity is to make groups. All you have to do is type the names of your students into a Google Spreadsheet and Flippity does the rest. 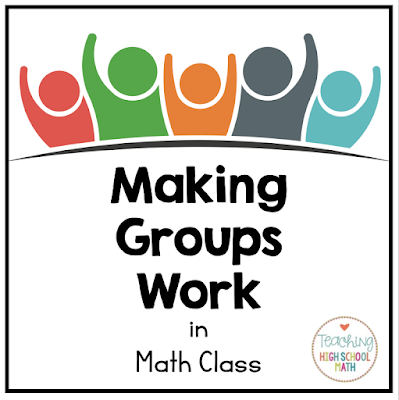 You can specify how many students you want in a group and then through the magic of google, groups are made! It's FREE! I use Flippity and then project the groups on the front board as students are coming into class. It eliminates arguments and gets everybody into a group. Even the loners who would rather be by themselves. There's no embarrassment to being left out. 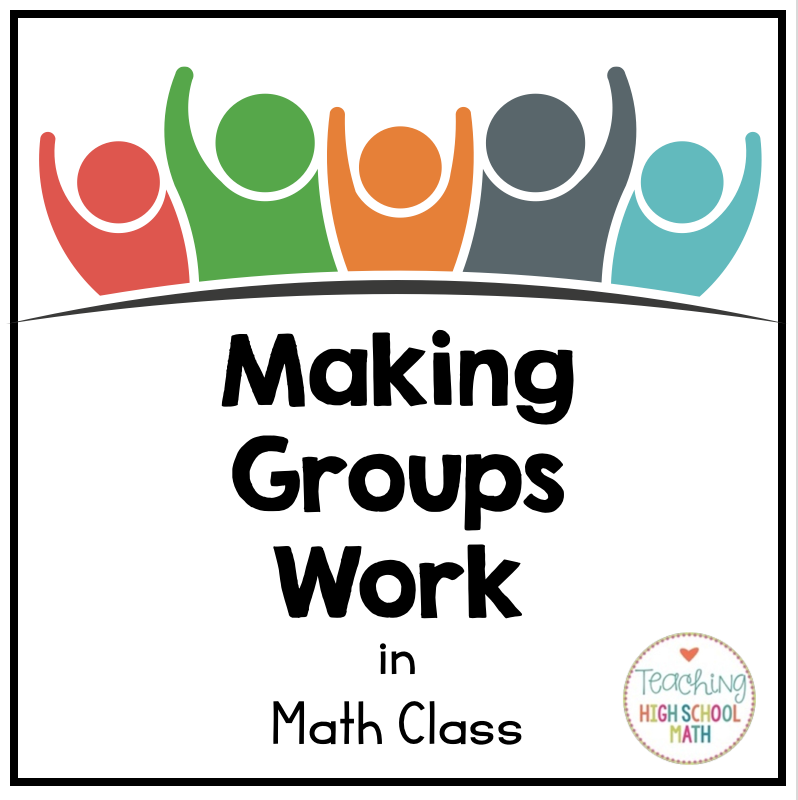 If you notice that the two kids in the class who just can't get along were randomly selected to be in the same group, you can change that easily even after the groups have been chosen. My students used to work better in groups. I gave them an assignment and they did it. It didn't matter if I was collecting it. They did it because I said to. These days, I feel that I have to make them more accountable. There are many ways to do this. You can give each student in the group a job - recorder, explainer, note taker, etc, etc. You can choose one student's paper from the group to turn in at the end of the assignment. You can have students enter their answers into a google form. Want to get more tips and tricks for your High School Math Classroom?